This is a rectangular Wadhams Motor Oil porcelain sign. This particular Wadhams Motor Oil sign is black with white and yellow text. 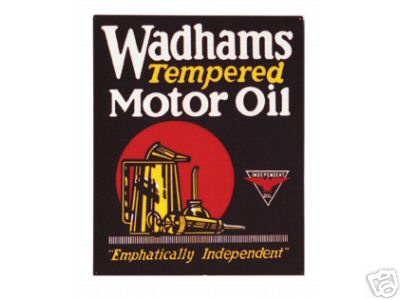 It reads, “Wadhams Tempered Motor Oil, Emphatically Independent” and features yellow oil injectors against a red circle in the center of the sign.